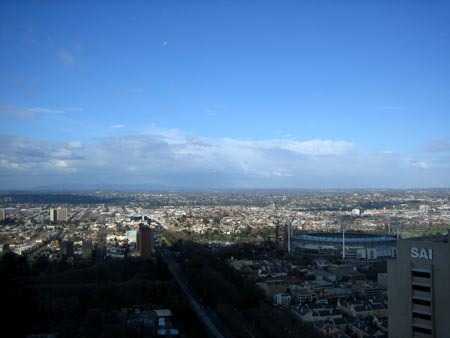 So we arrived in Melbourne (pronounced Melbin) after our great ocean road trip, and did some sightseeing. We walked down Batman street to the water first. 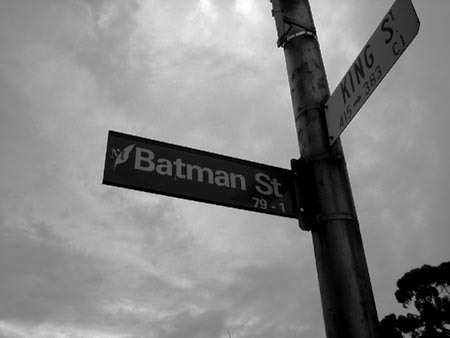 Batman founded Melbourne. Not joking. In 1835, a Tasmanian man by the name of Batman sailed up the Yarra River and founded Batmania. The British colonial administration didn’t agree though, and the name didn’t stick. He died in 1839 of syphilis at the age of 37. 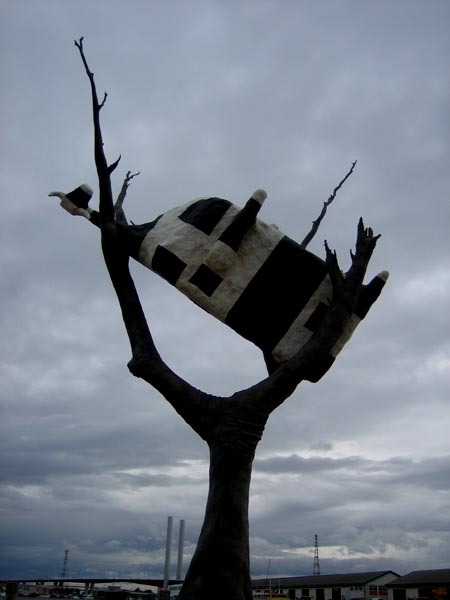 Down by the water was one of many pieces of public art we saw in Melbourne. The city is full of art in public places and it really makes it more interesting. 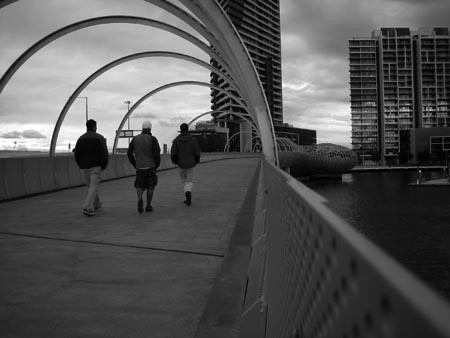 Marcus, Ron, and Stan walk over/through an artistic bridge/tunnel structure. 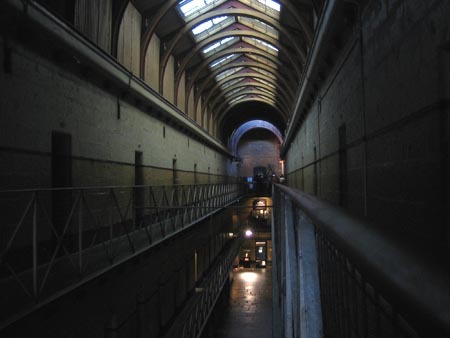 We visited the Old Melbourne Gaol as well, which is the oldest prison in Melbourne. It was a really interesting museum setup, and I spent over 2 hours in there. 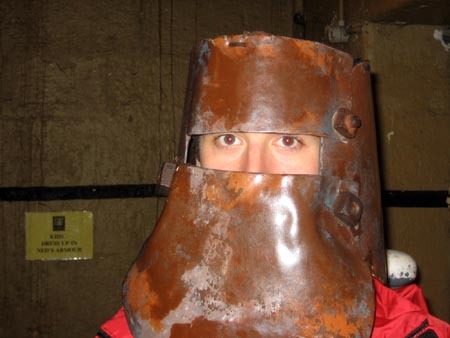 Ron decided to try on the replica armour helmet, similar to the one used by Ned Kelly and his friends in a shootout in Australia that spawned the biggest folk legend in Australian history. The problem with the armour was that the police shooting them eventually realized that the armour didn’t cover the legs, and 28 bullets in his legs later, Ned Kelly was captured alive. He was hanged at the Old Melbourne Gaol and we saw a great reenactment of his last days by some local actors. Jos and I did some walking around town on a beautiful day, and followed our hostel’s advice to get a free city view – we took the elevator to the 35th floor of the Hotel Sofitel, walked into the appropriate gender segregated bathrooms, and took photos of the city. The bathrooms on the 35th floor have floor to ceiling windows. Nice. 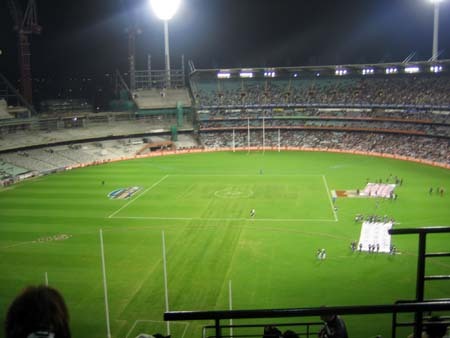 Later, we all went and watched an AFL game – Aussie Rules Football. It’s a strange but exciting blend of soccer, American football, basketball, and I daresay even volleyball. It’s played on an oval field and almost anything goes. 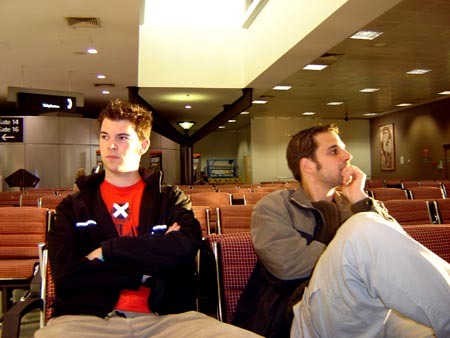 Jos, Marcus, and I flew from Melbourne to Christchurch on the 18th of July and caught a bus down to Dunedin several hours after landing. We arrived in Dunedin at midnight and soonafter went to bed.